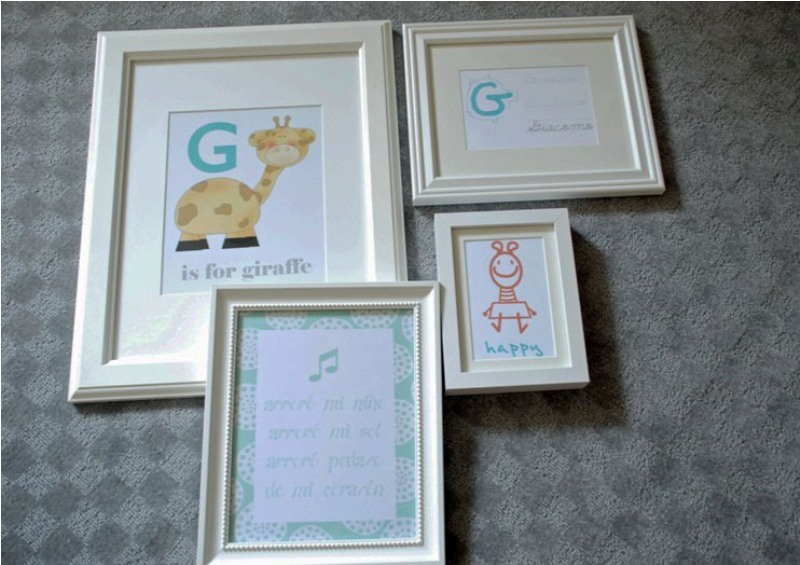 Today I have more nursery DIY details to share. We're truly happy with the results since we all worked hard on this room. And when I say all, I mean all. The mister and my mother-in-law painted the room, even L helped a little. My mom helped me put together the closet and finalized some other details. And most important we all did it with love and excitement! Mobile: It wasn't in my plans to make a mobile. I was going to make some tissue paper poms poms to hang above the crib. But during a visit to JoAnn (we don't have a JoAnn nearby but on our trip to Sesame Place there was one right around our hotel), I found these giraffe and elephant coat hooks on sale. I immediately started thinking what I could do with them and the mobile came to my mind. I grabbed an embroidery loop and some yellow ribbon, too. I already had some yellow and grey twine I got from Etsy for the pom poms. However the twine looked very "handmade"so I decided to use some silver beads and silver chain from Michaels. Wood letter: this didn't turned out as good as I expected. 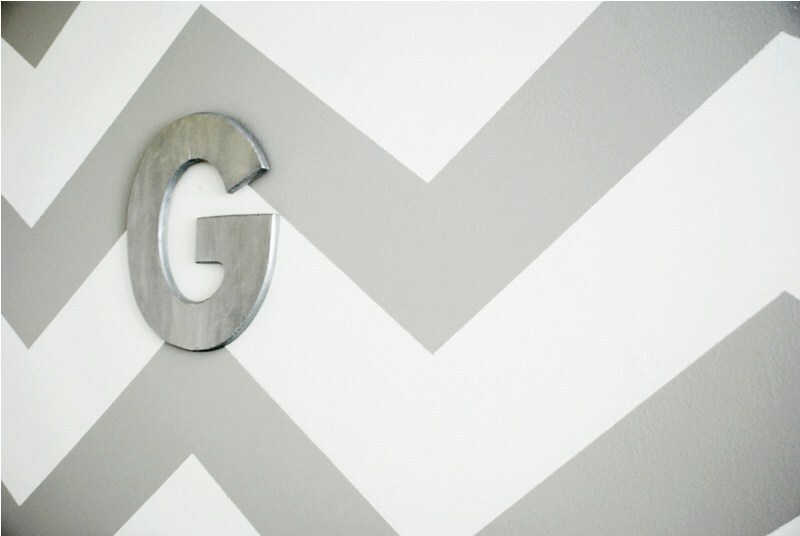 I wanted an oversized metal letter, like this from Anthropologie, but the hefty price tag disappointed me. I then found in blogland an easy DIY project I thought I could easily follow. However I bought the wrong wood letter. It was made of pine and to make matters worse I broke it. Michaels didn't have big wood letters so I decided to use my broken letter anyway and just paste it back. I also bought the Rub 'n Buff in the wrong finish, silver, instead of pewter like the tutorial said. Anyway, after three coats of grey paint (I used the same grey of the walls) and one coat of the Rub 'n Buff, this was the result. It is supposed to look like metal and it kind of does from far away so I think it's good enough. Cloth Doll: when my mom saw it, she said it looks more like a "llama", a peruvian camelid, than a giraffe (It was intended to be a giraffe!). Giraffe or llama I think it's cute!This was very simple to make. 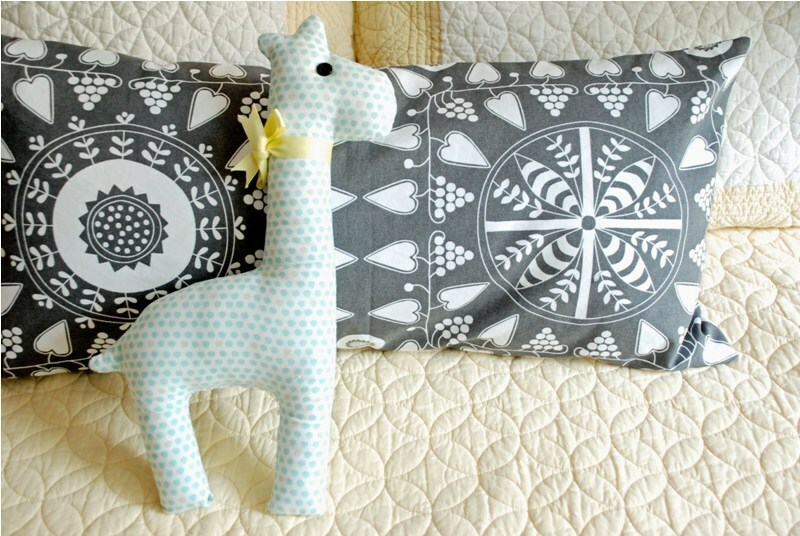 We bought a wood giraffe for the nursery that we ended up returning. But before we did, I copied the profile into a piece of paper to create a template. I then cut two pieces of fabric after the template and sewed it. I left the bottom opened so I can fill it with some polyester fiber fill. I closed the opening by hand. I added a couple of bottoms as eyes and a little piece of yellow ribbon. Artwork: Etsy is my place to go when looking for some original and cute artwork. However the variety they have is just overwhelming. I wanted everything. I wanted more artwork that I could place in the room. To distract myself I started playing in Microsoft Publisher and designed different posters and signs in different sizes. I had the big ones printed through Vistaprint. They turned out ok. The quality of their paper is not the best but you can't tell once it's framed. For the small ones I just used my inkjet printer. 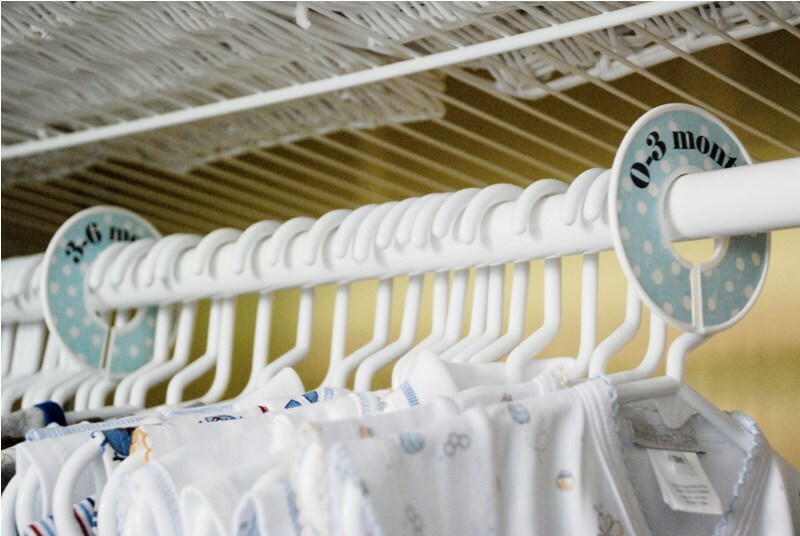 Closet dividers: This was a last-minute project. Honestly I was going to buy a cute set of closet dividers from Etsy, but since apparently baby G wants to wait to make his big appearance I decided to make my own to keep myself busy. I bought some closet dividers from The Container Store. They were $.99 each, pretty expensive for a piece of plastic if you think about it, but well, it's the closest and more accesible store. I drew a template in Microsot Publisher, adding the months on top and printed them in a some leftover wrapping paper I had from the changing table drawers I lined. I had fun doing these little projects. They kept me busy and excited about the arrival of my little boy. And I think they add a lot of meaning to his room. I'm not done with the DIY details. More to come! OMG this is just too beautiful!! Great job! I love the knitted sweaters for baby G too. Are you interested in sharing the template you used in publisher? I just purchased these, but not sure how to create a template! nicleblanc@aol.com THANKS! 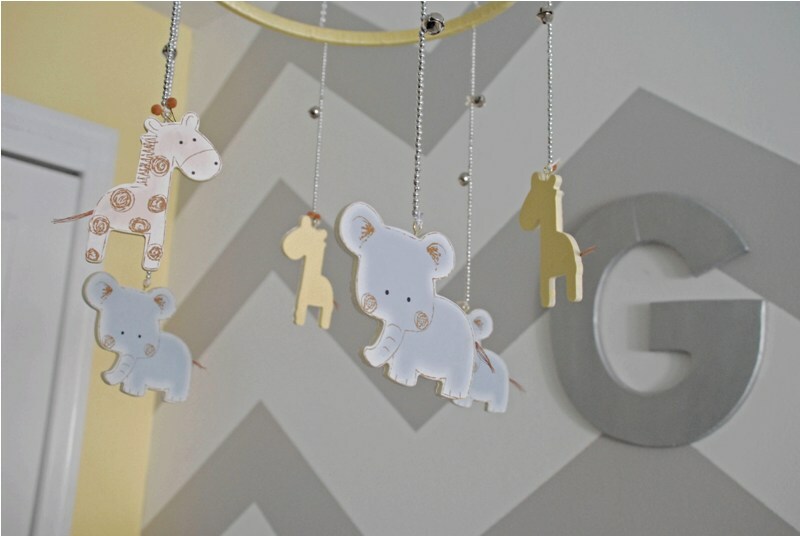 I love the mobile and would love to do something similar in my baby's nursery. How did you attach the chain to the animals? Are the animals made of wood? I can't tell from the pictures. I bought some balsa wood animals and I'm trying to emulate your results but can't seem to get it right. Any advice would be great! Just send you an email with some pictures. Hope it helps! Wow! Love it all! You have a great eye for color and balance. Would you be able to email those divider template that you made for my personal use? That was genius! Thanks Annie! So sorry for the late reply. I looked in my files and couldn't find the template :( I'll keep looking! This mobile is great - I just pinned in on Pintrest! I would also love to see the pictures so I can figure out how to get it right. Thanks.